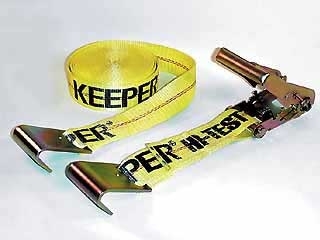 Heavy Duty Ratchet Tie Down with 10,000 Lbs. rated capacity - Ideal for commercial / contractor cargo control. A safe working load capacity of 1/3 of rated capacity is recommended. 31 IN. RUBBER STRAP - The DIZE (r) WEATHERMASTER (tm) 31 inch Heavy Duty Rubber Straps are molded from 100 percent EPDM Rubber and meet all ASTM Standards. The straps are designed to deliver quality, excellent performance and outstanding value. The 'S' Hooks (2-1/2 inches in length) are made from Silicon-Kilned Hard Tempered Galvanized Steel which provides excellent strength (Tensile 65,000 PSI min.). Maximum stretch - 54 inches. Made in the U.S.A.
21 IN. RUBBER STRAP - The Dize (r) Weathermaster (tm) 21 inch Heavy Duty Rubber Straps are molded from 100 percent EPDM Rubber and meet all ASTM Standards. The straps are designed to deliver quality, excellent performance and outstanding value. 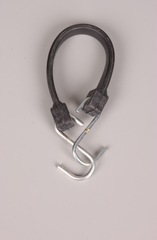 The 'S' Hooks (2-1/2 inches in length) are made from Silicon-Kilned Hard Tempered Galvanized Steel which provides excellent strength (Tensile 65,000 PSI min.). Maximum stretch - 36 inches. Made in the U.S.A. The DIZE (r) WEATHERMASTER (tm) 15 inch Heavy Duty Rubber Straps are molded from 100 percent EPDM Rubber and meet all ASTM Standards. The straps are designed to deliver quality, excellent performance and outstanding value. The 'S' Hooks (2-1/2 inches in length) are made from Silicon-Kilned Hard Tempered Galvanized Steel which provides excellent strength (Tensile 65,000 PSI min.). Maximum stretch - 27 inches. Made in the U.S.A.
15IN ECONOMY TIE DOWN STRAPS. 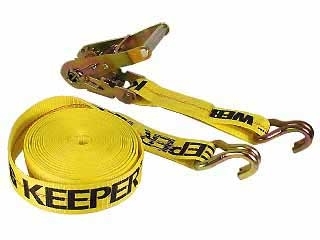 Straps are molded from 100% EPDM Rubber and designed to deliver top performance and value. 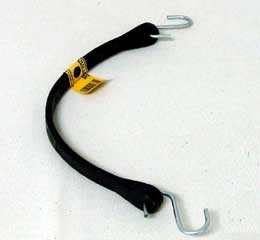 The S Hooks are 2 1/2 inches and are made of galvanized steel which provides top strength. 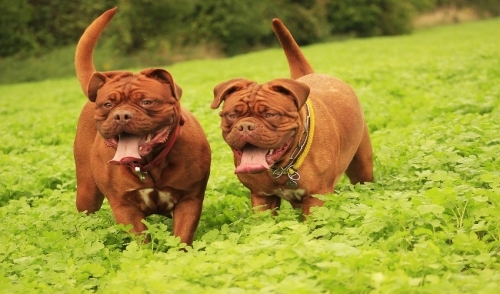 They come in five sizes which will satisfy a number of standard applications. The DIZE (r) WEATHERMASTER (tm) 10 inch Heavy Duty Rubber Straps are molded from 100 percent EPDM Rubber and meet all ASTM Standards. The straps are designed to deliver quality, excellent performance and outstanding value. 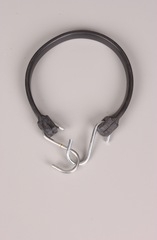 The 'S' Hooks (2-1/2 inches in length) are made from Silicon-Kilned Hard Tempered Galvanized Steel which provides excellent strength (Tensile 65,000 PSI min.). Maximum stretch - 18 inches. Made in the U.S.A.
Straps are molded from 100% EPDM Rubber and designed to deliver top performance and value. The S Hooks are 2 1/2 inches and are made of galvanized steel which provides top strength. They come in five sizes which will satisfy a number of standard applications. Two 15 Feet Ratchet Tie-Downs, 500 lbs. Working Load Limit, 1500 lbs. break strength. Full size, nonmarring vinyl coated S-Hooks. Ratchets provide maximum tensioning with minimum force. Spring loaded release mechanism prevents ratchet from opening accidently. Padded handle. 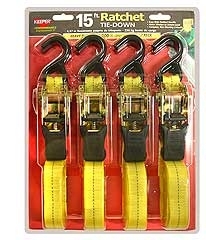 Features molded grip handles, 500lb working load limit (1500lbs break strength), 5 piece cut case display. Each tie down has a 500lb working load limit with a 1,200lb break strength. Full size, nonmarring vinyl coated S-hooks. Fast, easy to use cam buckle with a quick release thumb button. The cam buckle teeth grip the Hi-Test Webbing, will not slip and exceeds the needs of demanding applications. Use for full size motorcycles and ATVs. 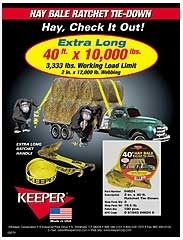 The hay bale ratchet tie-down has a extra long ratchet handle, it has a 3,333 pound work load limit. 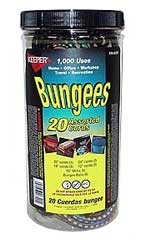 Assorted package of bungee cords in a convenient storage jar. 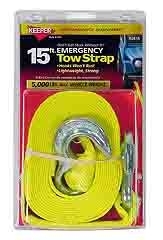 Contains: 1 - 32 inch Cord, 2 - 24 inch Cords, 2 - 18 inch Cords, 4 - 12 inch Cords, 5 - 10 inch Minis and 6 - Tarp Cords. Re-usable jar provides easy storage.